This semester, I am a new woman. My friend and I, having both suffered relatively recent periods of stagnation and weight gain (me last year, her last semester), have determined to reform our habits. Though I must say that I have been doing a supremely good job of eating healthily, the whole exercise thing has not been my forte. Nor has it ever been. And my friend … well, she’s not so good at either and has always lucked out by having a fast metabolism (until the college lifestyle got to her…). Anyway, for the first time in either of our lives, we are truly committed to being healthy. We’re eating healthy (working on smaller portions, particularly). Perhaps the most monumental change for both of us, however, is that we’re going to the gym. Every day. I have never in my life actually wanted to go to the gym, but something changed for me, and now I love it! We both do. In fact, not only do we go to the gym, but we get up at NINE to go. Yes. Nine. When I told my dad that, he said, “I’m sorry, I think I misheard. Did you say nine in the morning?!? !” For people who know me, the idea of me getting up early for anything at all is completely ludicrous. Correction: was completely ludicrous. Not anymore. The gym makes me feel so good that I will sacrifice my usual ten hours of sleep to go early. What has made this huge difference for me? My discovery of a wonderful exercise machine. When I used to think of the gym, I thought “treadmill.” And when I thought “treadmill,” it was always accompanied by a mental “Ahhhhhh!” In case that’s not clear: I hate the treadmill with a passion. 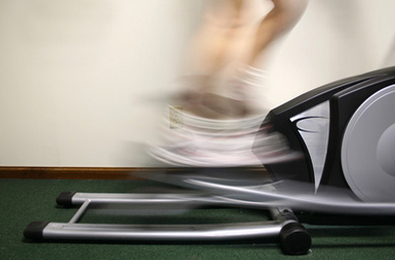 So, when my friend introduced me to the elliptical, I was amazed. It’s an amazing contraption! Really. What’s so nice about it is that it’s easy on your joints. It feels like walking or running on air! There’s no (or, at least, very little) strain on your spine, knees, ankles, and feet, and yet it still provides a strong cardiovascular workout. You can change the resistance without any added pressure on your joints; higher resistances also increase bone density and can decrease the likelihood of osteoporosis. What else do I like about the elliptical? It provides an upper body workout, too. The machine has levers that move back and forth with the circular motion of your feet, providing the arms with a workout equivalent to the resistance of your legs. I love it. Very much. In case you couldn’t tell. Anyway, I have changed my ways irrevocably, I do believe. As has my friend. For those of you who fear the gym as I did, I encourage you to try. It’s a different experience entirely, in my opinion. Lily Berthold-Bond grew up in a chemical-free zone and has struggled her whole life to understand and accept this non-commercial lifestyle. Now a sophomore at Tufts University, she has embraced her green life and hopes to share its possibilities with the rest of her generation. Thank you green girl! Help make the elliptical more easily available. I've always wanted an elliptical. Unfortunately, I don't have the space for one. I am looking for a compact version that works as well as the fuller-sized models. Wonderful article. Thank you Lily!!! I love the elliptical and I use it all during the winter. It's not as effective as running though, which I'm just starting up again since spring is here :). But as long as you find something you enjoy and stick with, that's what's important. Really? I like the treadmills, and hate elliptical. Of course, better than anything is running outside, on a hiking trail or XC course! If you're having trouble keeping in the habbit of going everyday, it's said that forcing yourself to go 10 days in a row will get you into it. At that point, your body actually craves the excercise! [http://www.youtube.com/watch?v=std2vfTV9fw&feature=channel_page] check out diethealth on youtube and their video "10 days to form a healthy habbit"
It was good to read your history, I really want to do that, but I don't know where is my will force? I think I need some kind of motivation, but I cannot find it! If someone has any advice, I will thank you? I love the elliptical too but the whole thing of nine being early almost made me stroke. Enjoy college life. And ten hours of sleep?!? I'm happy if I get that much over two nights. Oh to be in college again!